In my job as a fellowships advisor I stress to applicants that a strong application demonstrates three things: depth of expertise in a given field; breadth of interests and experiences; and the applicant’s change over time, i.e. history. The third pillar of the triad constitutes the all-important biographical element. 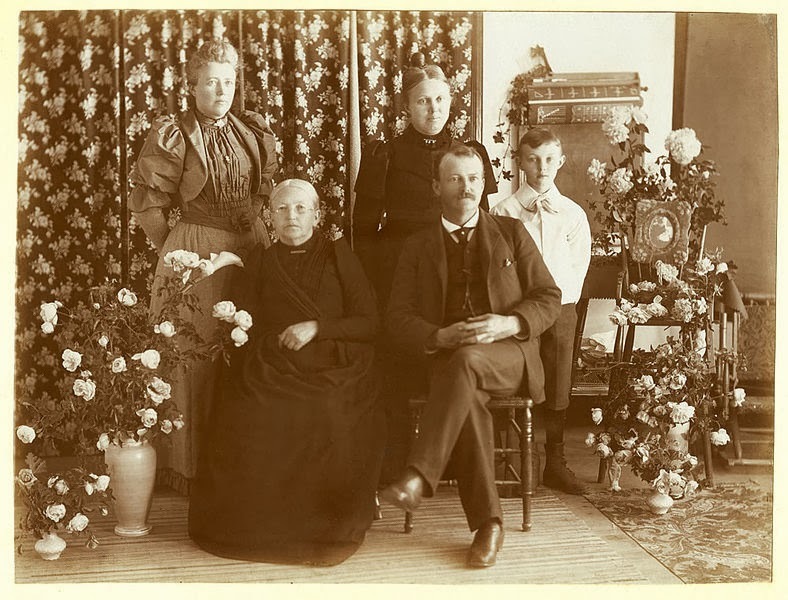 Americans' hunger for personal history makes Ancestry.com’s stockholders rich and guarantees the flood of genealogists to the shores of Salt Lake. The Ball family of Lompoc, California, ca. 1894. My sons started high school and middle school at the end of August. As I delivered my nearly­ men to the doors of their new institutions, my desire to make history from memory overwhelmed me. The hundreds of digital images stored on the family computer cried out for a chronology with which to capture the evolution of my chubby-­cheeked chappies into the skinny tweens who seek escape from their mother’s needy embrace. My compulsion has since produced three photo­books, and I am at work on two more. My mother used to assemble such tomes from the fragile prints of an earlier age. My photo­books exist in a cyber “cloud” as well as on my coffee table. My ability to shape the past into the form I like resembles the easier editing now accessible to authors of all history books. While David Hume wrote by hand and Oscar Handlin clattered at a keyboard, post­modern respondents to Clio’s call can, in a matter of seconds, place images on pages and produce flourishes that only the most able medieval monks could make over many days. The same woman who sat resentfully in archives and waited for genealogists to get off the microfilm machine so she could do her “real” research now neglects 18th-century documents for 21st-century snapshots. This history is my most real. I lived it. I interpret it for my own progeny. My intimate ties to my family finally managed to outstrip my intellectual engagement with the past. Change over time dominates a narrative in which few words appear. Twenty pages of pictures are equivalent to a tome like Albion’s Seed. The calculus premised on one picture bearing the same value as one thousand words integrates images into narratives with frightening speed. The Halloween and Christmas albums bring back my sons’ obsessions with Thomas the Tank Engine and Star Wars that seemed interminable in the moment but flashed by faster than Lightning McQueen in retrospect. The backdrops document home improvements and gardening experiments since forgotten. Relationships morph from page to page as erstwhile trick­-or-­treaters move away, children grow, and grown­ups go gray. I relish the lifeways of past peoples when a fine historian like David Hackett Fischer resurrects them for his readers. I revel in remembering the lifeways of my own little family in myriad private moments and wonder if any historian not yet born could relay them to strangers on our behalf. All the elements exist: the depth of our affection, the breadth of our interests, and their evolution over time. One day my sons might make lovely fellowship applications from the raw materials of their shared past. Could anyone else? Would I want them to try? The final question frightens this historian, who puts the personal tragedies of the long dead into public view. When I assemble an album, have I issued an invitation or proven the impossibility of my profession? This is an interesting reflection comparing two different perspectives on history. I would say: of course it is impossible to do with long-dead people that we never knew what we can do for people we do know. Nevertheless, we can do a less accurate version for those long-dead people that is valuable nonetheless. I think of the history we write as an asymptote, getting ever closer to reality without ever actually getting quite there.